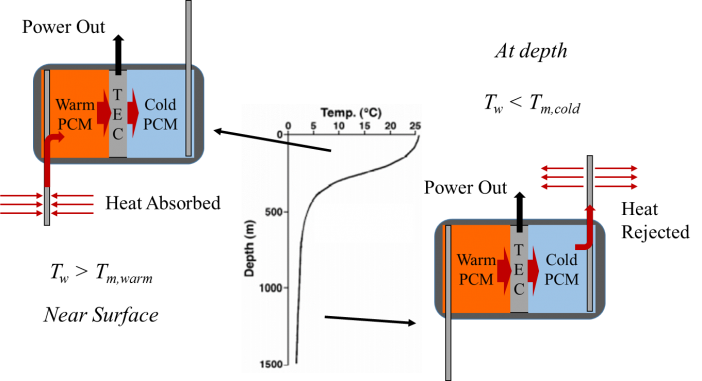 In a recent research study funded by the Office of Naval Research (ONR), Advanced Cooling Technologies, Inc. (ACT) has developed an ocean thermal energy harvesting system using the principles of latent energy storage in phase change materials (PCMs). In the mid- and low-latitude regions of the oceans, there is a significant temperature difference between the warm surface waters, and the water at depths below the thermocline layer. This temperature difference can be harnessed to generate electric power, with the system shuttling between the warm surface water and the colder, deeper water. The PCM-based ocean thermal energy harvesting system then operates as follows: When the vehicle is in the warmer waters near the ocean surface, the system will absorb heat from the ocean, storing it in the latent heat of the PCM by melting the PCM. Additionally, the different melting temperatures of the respective PCM volumes serve to establish and temperature drop across the TECs. Conversely, when the system is in cold water below the thermocline, the heat stored in the PCM will be released back to the ocean, freezing the PCM, and again generating power as a temperature difference is established across the TECs. A key enabling technology for the ocean thermal energy harvesting system is the use of thermosyphons, which are similar to heat pipes, but rely on gravity for condensed liquid return to the evaporator, to passively control the flow of heat to and from the ocean. To develop the PCM-based ocean thermal energy harvesting technology, the system was evaluated and optimized at the component level, and a dynamic system model was developed to predict the transient performance of the system. This model was used to perform trade studies and identify an optimum configuration for the PCM heat transfer enhancements within the PCM volumes, as well as other design parameters. The model was also validated through the testing of a “test-cell” prototype, which demonstrated an energy density of roughly 90 J/kg/dive-cycle. Two additional prototypes were built and tested to demonstrate the feasibility of the technology for different applications. These applications include an on-board power generation system to extend the range of small unmanned underwater vehicles (UUVs). This prototype, designed to be enclosed entirely within the hull of the vehicle is shown in Figure 2. The testing of this prototype, cycled between water temperature of around 2°C to 28°C, demonstrated an energy density of around 30 J/kg/cycle. The second prototype was designed to demonstrate the potential scalability of the technology using a modular system. This prototype is shown in Figure 3. This prototype was also tested by exposing the system to water temperatures cycled between around 2°C to 28°C. 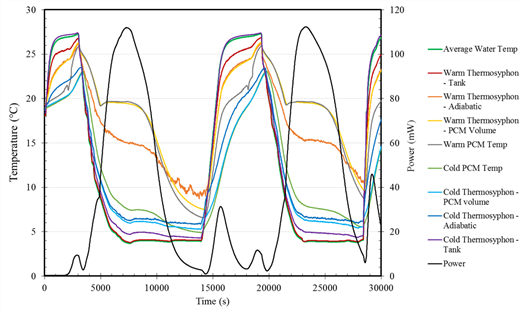 Some test data showing average system temperatures and the resultant power output from the TECs is shown in Figure 4. The prototype demonstrated an energy density of around 70 J/kg/cycle. 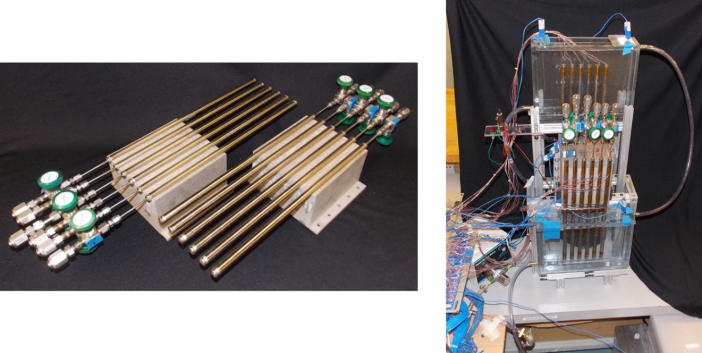 The PCM-based ocean thermal energy harvesting system developed under this ONR program highlights several of ACT’s core technologies and heat transfer expertise, including PCM thermal storage, and passive two-phase heat transfer. Have an application you’d like to discuss? Contact the thermal experts at Advanced Cooling Technologies.